Late afternoon light on the St Angel bridge leading to angels castle, Rome Italy. The castle was an old fortress during the medieval times and was renamed St Angel Castle after the archangel Michael was seen on the top signalling the end of the plague in Rome. 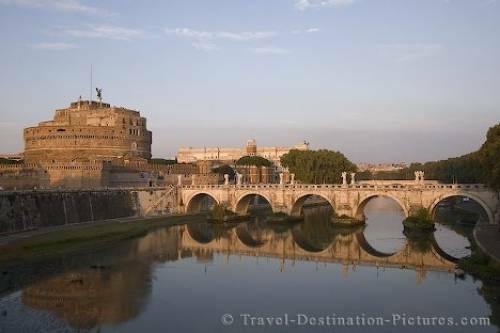 St Angel Castle and St Angel Bridge (spanning the Tiber River) in the city of Rome, Italy, Europe. Picture of the cylindrical St Angel Castle and historic Bridge in the city of Rome, Italy, Europe.